A SpaceX Dragon crew capsule prototype streaks into the sky during a launch abort system test on May 6, 2015 from Cape Canaveral Air Force Station in Florida. The Dragon was expected to reach an altitude of nearly 5,000 feet (1,524 meters) under the power of its eight SuperDraco launch abort engines, which are built directly into the side of the capsule. "What SpaceX is doing is certainly unique," said Jon Cowart, NASA's commercial crew program manager, of the company's decision to mount its SuperDraco engines on the sides of Dragon. "It's definitely revolutionary in that regard." SpaceX's Dragon crew capsule launches on an unmanned abort system test on May 6, 2015 from Cape Canaveral Air Force Station in Florida. The test lasted less than 2 minutes. Nearly 270 sensors recorded data during the test flight, which blasted off at 9 a.m. EDT (1300 GMT). SpaceX placed a human-shaped dummy in one of Dragon's seven seats to measure how the abort test, which was expected to pull up to 4.5 Gs, would affect a real astronaut. "It went from 0 to 100 mph in 1.2 seconds. 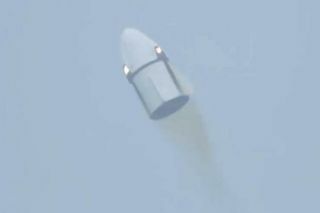 So that's pretty zippy," Musk said of the test flight, which peaked at a max speed of 345 mph (555 km/h). The dummy appeared to have fared well during the brief flight, he added. SpaceX's launch abort system is an emergency escape measure designed to pull the crew capsule free of its Falcon 9 rocket in the event of a launch failure. NASA has tapped SpaceX's Dragon capsule as one of two private spacecraft to fly American astronauts by 2017, so that safety measure is vital. Boeing's CST-100 capsule is the other private space taxi picked by NASA. "This flight [was] unlike any seen in Florida since the days of Apollo," NASA spokesman George Diller said after the launch. NASA used launch abort systems on its Mercury and Apollo spacecraft in the 1960s and 70s, but used ejection seats on the Gemini capsules, as well as early space shuttle flights. Russia's Soyuz capsules have long used tower-mounted launch abort systems, and they successfully saved two cosmonauts during one rocket failure. SpaceX's Dragon crew capsule prototype separates from its trunk module during a launch abort system test on May 6, 2015 from Cape Canaveral Air Force Station in Florida. The revolutionary part of SpaceX's abort system is two-fold. First, there is the side-mounted location of the SuperDracos. The launch escape systems used by NASA and Russia's Soyuz capsules are mounted on towers directly above the crew capsule. They are jettisoned before reaching orbit. SpaceX's SuperDracos, however, can be used all the way to orbit, offering increased safety, company representatives have said. A SpaceX Dragon crew capsule prototype parachutes down to an ocean landing after a launch abort system test from Cape Canaveral Air Force Station, Florida on May 6, 2015. Riding aboard was a human-shaped dummy. Koenigsmann described Dragon's SuperDraco design as "a more sophisticated, modern approach" to launch escape systems. "In my opinion, this will make it the safest vehicle that you can possibly fly." In a second innovation, all of the SuperDraco engines are 3D-printed, and today's test marked the first time they fired in unison to catapult an 8-ton Dragon capsule off a launch pad. Each SuperDraco engine generates about 15,000 lbs. of thrust, with the entire system putting out 120,000 lbs. of thrust. "It's got a lot of kick," Koenigsmann said. And SpaceX engineers have designed the SuperDracos to serve as both launch abort engines, as well as descent engines. If a Dragon launched smoothly, the SuperDracos could then be used to make a land-based landing for eventual reuse. Musk has been pursuing reusability with SpaceX's Falcon 9 rockets and Dragon capsules in an effort to lower the cost of human spaceflight. "I personally think this is the coolest looking spacecraft that you can see," Koenigsmann said. During the test, eight SpaceX-built SuperDraco engines fired together for just 6 seconds, sending the spacecraft about 1.4 miles (2.2 kilometers) offshore into the Atlantic. "Hang tight everyone!" a SpaceX flight director was heard to exclaim in a NASA broadcast as the Dragon floated down to its ocean splashdown. SpaceX's first Dragon crew capsule floats in the Atlantic Ocean, its parachutes nearby, after an unmanned launch abort system test from nearby Cape Canaveral Air Force Station in Florida on May 6, 2015. Three SpaceX recovery boats — two speedboats and one barge — were waiting nearby to retrieve the capsule. The Dragon crew capsule will ultimately be returned to SpaceX's testing site in MacGregor, Texas for more analysis. "It does not have to be flawless for us to call it successful," Cowart said. "The point is to gather data. We can live with something that's not perfect." One test flight, Cowart added, is worth 1,000 analyses. SpaceX will follow up today's flight with a more complicated high-altitude test that will launch an unmanned Dragon crew capsule atop a Falcon 9 rocket, then test the launch abort system during the ascent. Another test flight will launch an unmanned Dragon crew capsule on a completely automated trip to the International Space Station and back. "It's not clear which of those tests will precede the other," Musk said, adding that it will depend on the readiness of the vehicle. "We expect to accomplish both of those well within the next year and a half." Last September, NASA awarded SpaceX $2.6 billion to complete its development work on the crewed Dragon capsule and aim to launch astronauts by 2017. Boeing received $4.2 billion to complete its own work on its CST-100 crew capsule. Musk said the success of today's test flight bodes well for SpaceX's crewed Dragon program. "Hopefully within two years we'll be transporting crew to the space station," Musk said. "We're just really looking forward to it, and it's going to be super-exciting." Meanwhile, officials with SpaceX and NASA officials plan to pore over the data collected during today's flight. Cowart, for one, was excited to see what it might reveal. "These are the kinds of things in rocketry that we live for," he said. "These are the days we live for in this business." Editor's note: This story was updated at 12:29 p.m. ET to include comments by SpaceX CEO Elon Musk on the Dragon pad abort test's success.